For the third time in less than three weeks, Team Sky were back on the victory podium, this time with a team time-trial win in the Tour of Qatar. First across the finish line on the windy 8.2 kilometre circular course was 2009 Tour of Britain winner Edvald Boasson Hagen, who now leads the race. But whilst the Norwegian got the yellow jersey the entire Sky team, together with sports director Scott Sunderland rightly stood on the podium to soak up the applause after a well-calculated group effort in – let’s not forget- their first ever team time trial. The extremely windy conditions on a highly exposed course round a lagoon just outside the capital Doha, together with such a short course, meant no mistakes could afford to be made by any team in contention. 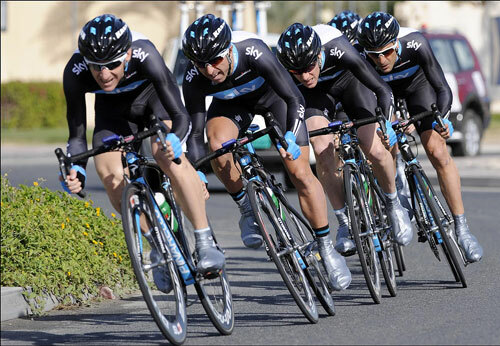 But Sky – which had checked out the course several times in the morning – and their team plan worked out perfectly. Russell Downing powered the team up to speed, then the bigger engines like Bradley Wiggins, Geraint Thomas and Juan Antonio Flecha took over. Wearing his British time trial champion’s jersey, Wiggins powered into the final corner but when it came to the finish line a few hundred yards later Boasson Hagen was first across. “It was good, a great result” Sunderland told Cycling Weekly. The strongly gusting winds left some teams completely split apart, with World Time Trial champ Fabian Cancellara (SaxoBank) providing the surprise of the day by being dropped, although his team only lost 13 seconds. Quick Step and Tom Boonen were fifth, 20 seconds back, meaning the multiple winner of Qatar overall will have to battle hard for time bonuses in the five remaining stages if he wants to repeat his 2009 victory. Team Cervelo with Britons Roger Hammond and Jeremy Hunt rode very strongly and were second on the provisional results. However, that was set to change, with last year’s winners Garmin-Transitions due to move up a spot from third, eight seconds back, should race commissaires finally decide to penalise the Swiss squad by a minute for an alleged illegal manouvre. Cervelo, who were one of the dominating forces in this race last year – winning one stage with Hammond and finishing second overall and who have come here with a strong squad again – have made a strong protest over a decision they feel to be completely unfair.